A good place to explore the spiritual “What’s it all about?” of our lives is by beginning with our own ponderings, wonderings, and questions. If your desire is to look more deeply into your own soul questions, my practice offers you a time, place, and space for your discernment and discovery. I offer one-on-one spiritual direction and companioning as well as facilitation of clearness committees. 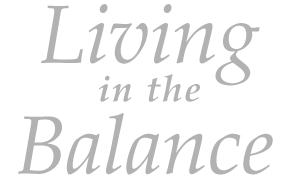 I invite you to explore my monthly Living in the Balance journal which contains a brief reflection piece and a listing of upcoming events and programs in the Upstate and surrounding areas. These programs have spiritual aspects and include different faith traditions. You’ll find everything from the Celtic Christians to the Dali Lama and one-day workshops to fourteen-day pilgrimages. And there is a selection of “on-line” and e-courses, too. One of my own re-discovered passions is photography and from time to time, I’ll share an image with you along with some thoughts to ponder. I’ve found that my attention can be captured equally by a wild flower or a mud hole……so be prepared for a surprise! If you can learn to look at yourself and your life in a gentle, creative, and adventurous way, you will be eternally surprised at what you find.